fashion. These designers include Coco Chanel, Jean Patou, Jeanne Lanvin and Elsa Schiaparelli. Chanel's spirit sums up the essence of the 1920s. The Roaring Twenties were all about becoming "someone" - separating yourself from the old and "making life new".Chanel set the stage for modern fashion by creating a signature style, a brand awareness, and a social buzz around herself like no one had ever done before. Chanel saw the needs and desires of women and designed her fashion around what women wanted. Women wanted freedom from the constraints society and fashion had placed upon them, beauty without shackles. Chanel's designs lent a previously unknown practicality to women's fashion. Her elegant and versatile fashions were made from durable fabrics usually reserved for men's work clothes. Chanel stripped fashion of excess material, frilly lace, and the constraints of the past. Her technique of adorning women with beautiful jewelry with was suited to her vision of the modern woman since they would not have to fight extra layers or constricting shoulder pads of the Victorian era. While the fashions of the Victorian Age split a woman's body into two halves, upper and lower, Chanel found continuity and symmetry between the chest, and waist. In Chanel's famous words she "let go of the waistline" and came up with a silhouette that has been in style for nearly a century. Through her innovation and vision to renew women's fashion, Chanel's business was exploding as her styles caught on throughout Europe and America. Chanel's "Garconne Look" was quickly adopted in Britain and the U.S., creating the face of fashion in the 1920s: the flapper. Chanel also created what is now a staple in the modern woman's wardrobe: the "Little Black Dress" as well as her signature scent Chanel No 5 in 1926. (L-R) Chanel dressing one of her models in a Little Black Dress, Chanel designs circa. 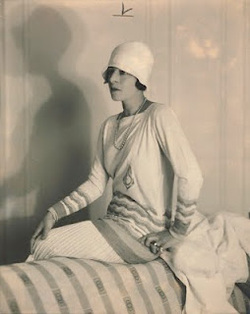 1928, A young Chanel dressed in the androgynous Flapper style. Breaking the rules of classic concepts of fashion, designer Jean Patou re-made the history of the dress with revolutionary new concepts. 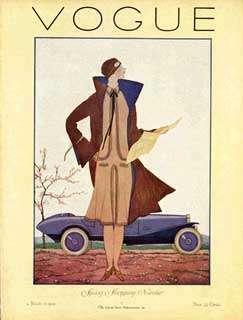 Jean Patou made a huge impression with his new ideas into fashion, including introducing sportswear for women. He also invented the knitted swimwear and the tennis skirt for the extravagant Suzane Lenglen, a French tennis champion, in addition to designing the daring and, at the time, scandalous, sleeveless and thigh-length tennis dress. He helped define the youthful, athletic look of the mid 1920s by producing exquisitely cut short dresses, often pleated or fitted with geometric inserts to ensure freedom of movement, and by introducing "Cubist" sweaters and bathing suits. He identified this style as particularly "American" and stunned the fashion world by having American models walk the runway of his Paris shows. Jeanne Lanvin headed one of the premier Paris couture houses of the 1910s and 1920s, even though her "pretty" dresses contrasted sharply with the slim, almost androgynous aesthetic of that period. Lanvin's designs seemed to exist in a time of their own: although modern, they were never governed by the prevailing modes. For Jeanne Lanvin, women were meant to wear clothes of unabashed feminity, in colours that were pretty, and whose shapes had a "young girl" look. She set the mood with narrow empire-waisted dresses and long trailing sleeves. During a period when fashion offered only a single silhouette, Lanvin offered a feminine alternative. In the early 1920s, when skirts were slim, she championed the robe style, inspired by eighteenth-century fashions, which featured a full skirt supported by a knee-length oval hoop petticoat. This style was associated so closely with the House of Lanvin that it is still used today on the Lanvin label. Original Hand Knit Sweater with Bowknot, November 1927. Black & White Wool. able to secure a portion of the market and designers such as Elsa Schiaparelli made a name for themselves. Schiaparelly presented practical and comfortable sweaters, wool cardigan jackets, beach pajamas and an array of matching accessories. In the 1920’s, the sweater was an important piece of clothing for a new type of “modern” woman who would rather play a game of tennis than sit still in a parlor. But sweaters of the time tended to lose their shape quickly which resulted in a sloppy appearance. In the Spring of 1927, Elsa Schiaparelli noticed awoman in Paris wearing a plain but unusually woven sweater, which didn’t seem to stretch and had what Schiaparelli later described as a “steady look.” Schiaparelli discovered that the sweater had been knitted by an Armenian woman using a special double layered stich. She soon recruited the young woman to knit several prototypes for her. Schiaparelli drew a white bow to look like a scarf tied around the neck of a sweater on a black background and had the design knitted into the sweaters. This created a new sensation in the fashion scene and changed the style of women's sweaters. newsprint or cancelled stamp patterns, buttons in the shape of tiny snails and collars made from feathersand monkey fur. It was Schiaparelli’s bold, whimsical approach to fashion which allowed her to differentiate herself from other designers in the 1920s. Chanel once described her as that “Italian artist who makes clothes” but it was her artful approach that made her distinctive. She built upon fashion trends that had been developing since the late 1800s, branding them with her own unique sensibility. Although many of the designs are over ninety years old, her revolutionary approach continues to influence the fashion world of today. Schiaparelli Designs 1927-1929. Far Right: Dinner Jacket in Schiaparelli's original "shocking" pink.